Carrie Kahn Carrie Kahn is NPR's International Correspondent based in Mexico City, Mexico. November 13, 2017  The Haitian police must now take over the duties of securing the nation now that U.N. peacekeepers have left. And Haiti's President says the United Nations' withdrawal is a perfect time to reinstate the once infamous national army a move that has sparked concerns. November 13, 2017  Brought in to restore peace and stabilize the western hemisphere's poorest nation, the U.N. force, which at its height had more than 7,000 troops, has left a mixed and sometimes deadly legacy. November 10, 2017  When the U.S. ambassador to Costa Rica was asked what he would do after Trump asked for his resignation, he joked that maybe he would go on Dancing with the Stars. That's just where he has landed. November 7, 2017  The Trump administration is ending Temporary Protected Status for thousands of Nicaraguans who were given safe haven following devastating natural disasters decades ago. The administration is expected to end similar programs for other Central American countries and the Caribbean. November 5, 2017  Haitians are facing several challenges as UN Peacekeepers withdraw from the island after a 13-year mission. 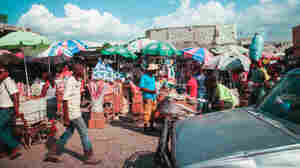 President Trump is set to announce an end to protective status for some 50,000 Haitians living in the U.S. NPR's Carrie Kahn just returned from Haiti where she sat down with the Caribbean nation's new president. Haitian Immigrants Fear End Of Protected Status In U.S.
November 3, 2017  Many Haitians in the U.S. were granted Temporary Protected Status, barring them from being deported home after the 2010 earthquake. The Trump administration says it plans to end the special status. November 3, 2017  President Trump is beginning a trip to Hawaii and Asia. Economic policy and North Korea are expected to top the agenda. Also, New York City is preparing for a marathon after the terror attack. October 11, 2017  Puerto Rico's power grid was in bad shape even before Hurricane Maria knocked power out to nearly the entire island. Officials say it will be at least six months for the lights to come back on. October 9, 2017  The Guajataca dam in northern Puerto Rico suffered a major breach in its emergency spillway. At one point up to 70,000 people were in immediate danger. The Army Corps of Engineers thinks it can fix the breach, but the dam is not secure and is yet another example of Puerto Rico's crumbling infrastructure that is barely standing after Hurricane Maria hit the island. October 9, 2017  Residents of Arecibo love the 350-foot-tall statue, which they hoped would bring tourists to their region. 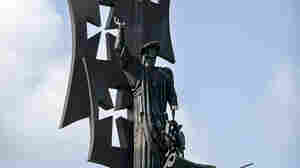 But they aren't fond of the conquistador who people say discovered the island and America. October 6, 2017  The official death toll in Puerto Rico after Hurricane Maria is 36. But the actual toll is suspected to be much higher, with uncounted bodies piling up in places that still have no way to communicate. September 29, 2017  NPR's Carrie Kahn lives in one of the neighborhoods hit hardest by the earthquake. Some of the neighborhood is back up and running, but it will take years from it to return to where it once was. September 27, 2017  Many schools have gotten the green light to reopen, but others are either damaged or near damaged buildings. That uncertainty is putting a lot of stress on parents and kids hoping to get back to normal. September 25, 2017  The central Mexican town of Cholula is rich in colonial architecture and home to many churches. It's said there are actually 365 — one for every day of the year. But many were damaged by the quake.